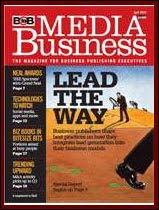 I'm reading: The challenges of lead generation in B2B publishingTweet this! I think that publishers, who operate over this approach in striking position to anticipate new ways of doing business and give customers more knowledgeable and effective solutions will be standing when the economy finally rebounding. But if companies do not change the culture inside, they may be among those left in the dust.